Jesús Carmona was born in Barcelona. He started to learn to dance at the age of seven in La Macarena and El Niño de Morón. Later he finished his studies in the Institute of Theatre and Spanish Dance in Barcelona, where he studied Spanish Dance and flamenco Barcelona. To improve his dancing skills, Jesús Carmona took several courses and dance classes with such masters as Escuela Bolera with César Casares, Pilar Cambra, with Gilberto Ruiz-Lang, Elisenda Castells, Rosa Alba and Montse Lloret and Avelina Arguelles in Danza Contemporánea, Bárbara Kasprovich, Ion Garnica, Rodolfo Castellanos, Ion Beitia, and Carmen Huguet in Classic Dance, and flamenco Barcelona with Nacho Blanco, Sonia Poveda, Antonio Canales, Domingo Ortega, María Magdalena, Eva Yerbabuena, Ángel Rojas, Belén Fernández, Juana Amaya, Manuela Carrasco or Rafaela Carrasco, among others. The dancer received third award of Choreography in the contest Nou Barris-2001 and Young Values mention in the National of flamenco Barcelona Dance in L’Hospitalet-Barcelona 2002. Jesús Carmona debuted professionally with with the Orchestra of the Liceo Theatre of Barcelona in the Zorrilla Theatre, when the dancer was 16 years old. From that moment Jesús started to work as a professional dancer. He joined the New Spanish Ballet and other companies such as El Güito, Carmen Cortés, Antonio Canales, Esther Carrasco, La Truco and Mónica Fernández. 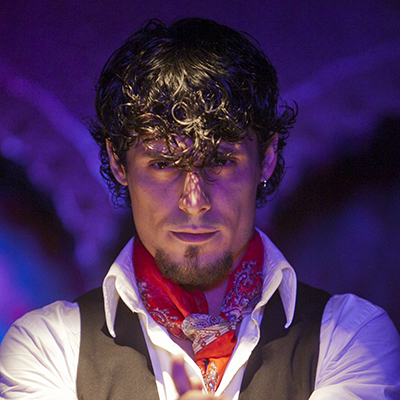 In 2006 Jesús Carmona released his first show “El Silencio de La Luna”. That was a very important moment for his professional career. The show was very successful and it was acclaimed by the critic and the public. In the same year, due to all his dedication, efforts and talent he was elected to be part of the National Spanish Ballet. The following year he became the main dancer of this company. While he was working in this company, the dancer performed in several shows such as “Golpes de la Vida” by Rojas y Rodríguez, “Albarada del Gracioso” by Maestro Granero, , or “Ritmos” by Alberto Lorca. In all of them Jesús stand out thanks to his technique, work, style and artistic talent. In 2010 Jesús Carmona participated in the tour of Rojas y Rodríguez through Asia as a guest artist, with the National Spanish Ballet. They presented the show “Corazón de Piedra Verde” and besides that, Jesús was teaching various courses and masterclasses in different countries: Netherlands, India, Italy or France. His enthusiasm, personality and his desire to improve his artistic talent and career brought him to quit the National Spanish Ballet. Since that moment the dancer started to work in a new project “Cuna Negra y Blanca”. In 2012 Jesús Carmona joined the company of Pastora Galván. Also Jesús appeared as main dancer in the show “Duquende” and received the Desplante Prize in the 52º International Sing Festival of Las Minas de La Unión. In 2013 the dancer participated in the festival Suma Flamenca. Also during his career the dancer participated in several festivals such as Jerez Festival, flamenco Barcelona Festival in La Villette, Bienal of Sevilla, Sing Festival in Las Minas, Jueves flamenco Barcelonas in Cajasol.